HCM CITY – Leaders of parliaments in the Asia-Pacific region and the Inter-Parliamentary Union (IPU) took fact-finding trips around HCM City yesterday to learn about the impact of climate change. Joining the trips, which formed part of an IPU symposium on climate change response, were Việt Nam’s National Assembly Chairwoman Nguyễn Thị Kim Ngân, IPU President Saber Chowdhury, IPU Secretary-General Martin Chungong and about 200 representatives from the parliaments of 24 regional countries and international organisations. The delegates visited the Dần Xây residential area, which is often inundated by tidal surges and has suffered from land erosion. Although the area is part of the Cần Giờ protective forest--a world biosphere reserve--unplanned land reclamation for home building has damaged the recovery and development of the submerged forest ecosystem. The parliamentarians were briefed on to HCM City’s response to the problem, which is resettling households to safer places. The resettlement is meant to protect the Cần Giờ forest while improving local residents’ material and spiritual lives. 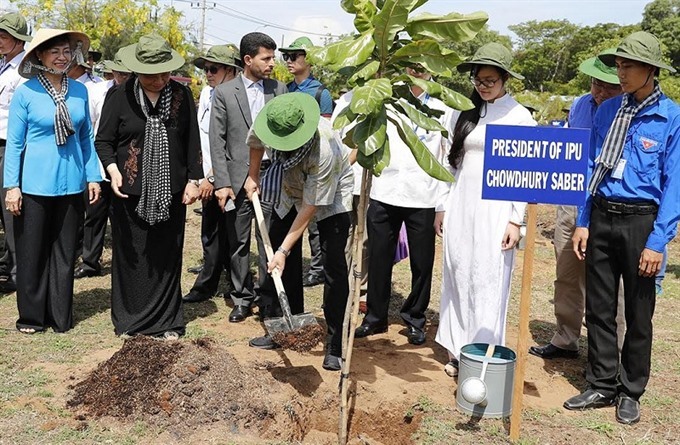 After visiting the Dần Xây residential area, participants planted trees at an area zoned off for building the Rừng Sác Cultural Park in Cần Thạnh Town of Cần Giờ District. Speaking at the tree planting ceremony, Vice Chairman of the HCM City People’s Committee Lê Thanh Liêm called climate change a major global challenge for the 21st century. HCM City has been well aware of climate change impacts and has implemented solutions such as afforestation and forest protection to mitigate climate change’s negative impacts on the local people’s life and socio-economic development. The 50 bàng vuông (Barringtonia asiatica) trees planted during the event are adaptive to drought and other severe climate conditions, he noted. Applauding HCM City’s organisation of the tree planting event, IPU President Saber Chowdhury said the IPU symposium on climate change response for the parliaments in the Asia-Pacific region is not simply a dialogue but also a demonstration of legislators’ actions in the face of climate change.